Given that India is experiencing a fast-paced growth on the back of technological disruption and innovative thinking there is an opportunity to bring the same to solve the public healthcare challenge. Government statistics show that community healthcare centres are falling short of specialists and 63 per cent of hospital beds belong to private sector. India has the world’s second largest population which went from 760 million in 1985 and doubled in size by 2015. This rapid rise in population has not seen an appropriate increase in health services for the population. Budgetary allocation to public health is only 1.2 per cent of the total health expenditure which is far lower than the WHO recommendation of 5 per cent. This lack of funds hits public healthcare infrastructure, lack of experienced medical staff to manage the burgeoning population. Government statistics show that community healthcare centres are falling short of specialists and 63 per cent of hospital beds belong to private sector. This gap is sharper when you look at the rural sector which has a higher percentage of the population and are financially weaker. Given that India is experiencing a fast-paced growth on the back of technological disruption and innovative thinking there is an opportunity to bring the same to solve the public healthcare challenge. Tracking the healthcare outcomes on a real-time basis will allow for a clearer picture for the authorities to deploy funds and resources in the most appropriate manner. The focus would shift from providing healthcare to ensuring better outcomes. This would allow for a value-based healthcare system. Judging the health care providers performance on outcomes would introduce a clear target that rewards innovation. To ensure this the policy makers should introduce a standardized collection and reporting methodology. There is an investment necessary to build digital IT systems that can improve the quality of care provided by clinicians. And for a country as vast as India a universal system of tracking health records. The system would contain every patient’s complete medical history and should be made available to any healthcare provider across all organization while still ensuring the privacy and security of the patient information. The data collected can be leveraged to understand the efficacy of the processes and protocols being implemented. The larger analysis of this data can help keep a track of healthcare trends, track disease, understand policy impact and anticipate demand for drugs / care. This information would be vital to better divert funds to specific resources that are required at the point in time. Close to 70 per cent of the country does not have health insurance, which makes them vulnerable to financial distress related to critical medical procedures or hospital convalescence. There is an urgent need for a national health insurance system that would provide economically viable health coverage and reward high quality, cost-effective patient care that is empowered by new age technologies such as analytics and artificial intelligence. Through the use of artificial intelligence and the use of digital health, records actuaries would be able to detect claim anomalies that were previously difficult to ascertain. The system should be paperless and frictionless to reduce the probability of fraud. Over 60 per cent of the population live in rural areas in India that are in remote locations without easy access to the primary health centres that are spread over a vast area of land. This is compounded with the fact that people opt out of traveling these distances for minor injuries and ailments that exacerbate due to non-treatment or incorrect home remedies. Mobility and digital technology platforms have the potential of bridging this deficit by allowing doctors to remotely treat patients in under-resourced areas efficiently and economically. 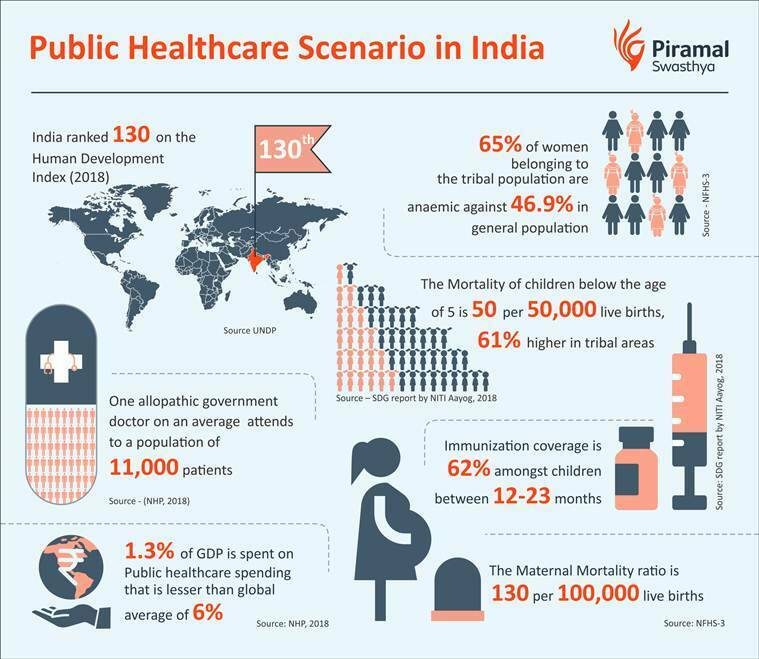 Organizations such as Piramal Swasthya have been set up telemedicine helplines and are working with state governments to provide primary healthcare diagnosis and prescribe medication and treatment based on the severity of the condition. This has greatly increased the access to primary healthcare for the underserved areas. This is the type of technology solution that can be deployed at scale throughout the nation. Empowering healthcare service professionals that are delivering at the last mile with mobile-enabled resources to provide lifesaving care to the doorstep of those living in remote areas. These resources can enable mobile diagnostics, improve collection of data and real-time consultation with doctors that are available through Telemedicine solutions.